We’re pretty darn lucky here in Cali, summer grillin’ really lasts at least 10 month out of the year. But June through August, our beloved char-coal grill certainly gets more of a workout during the summer. By default, Joe always did the grilling. He bought the coals, started the fire and manned the meat. I usually make the side dishes or the salad while he maintained the grill for dinner. But finally, on a lonesome summer day, I said… “I want to learn how to grill”. And I didn’t mean a gas grill, I know how to work one of those…I mean our char-coal grill. I want to man the coals, start the fire….girls can grill too! Joe didn’t even bat an eye and jumped up as enthusiastically as me. So there, on that day, I grilled. And what a blast I had. Grilled kofta was on the menu, which is not much different than kabob. 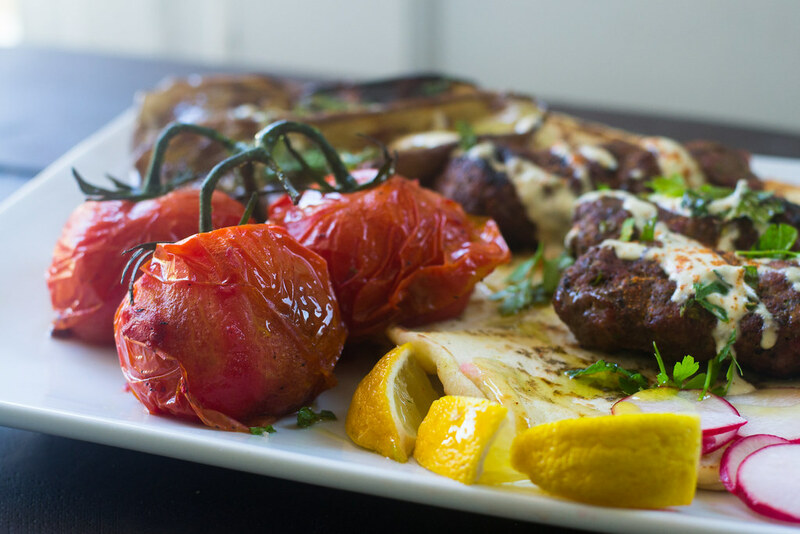 From what I’ve read, both kofta and kabob can be from ground meat grilled over coals, but kofta can be made at home and kabob is usually made by a street vendor. 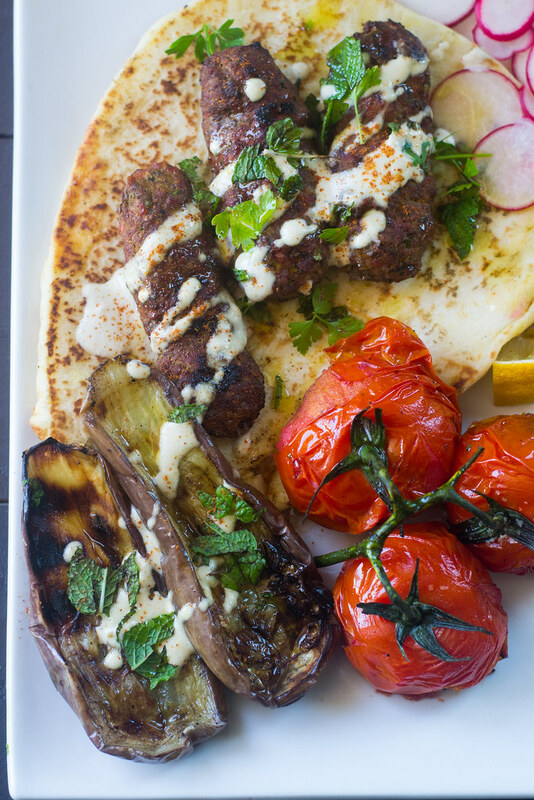 The kofta grilled perfectly and maintained it’s crimped shape and the eggplant and tomatoes charred and softened beautifully. After everything was cooked, I placed the meat on top of pita bread in proper Turkish fashion, so that all the meat juiced soak into the bread. And the flavor…oh my gosh, the flavor. The flavor of freshly charred eggplant from robust coals and smoke is like no other! 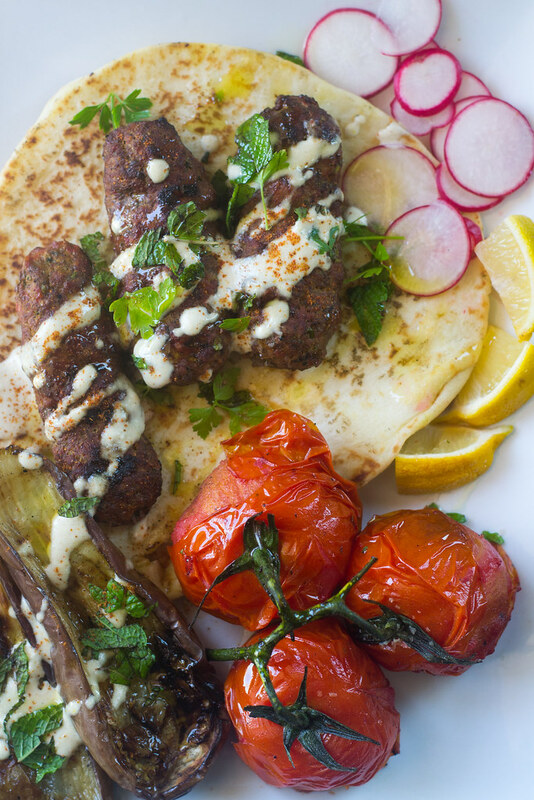 Get grillin’ and check out the grilled kofta recipe on The Nosher! What’s your favorite thing to grill?? I had kofta for the first time earlier this year and just recently made it for the first time at home. So stinking good both times! 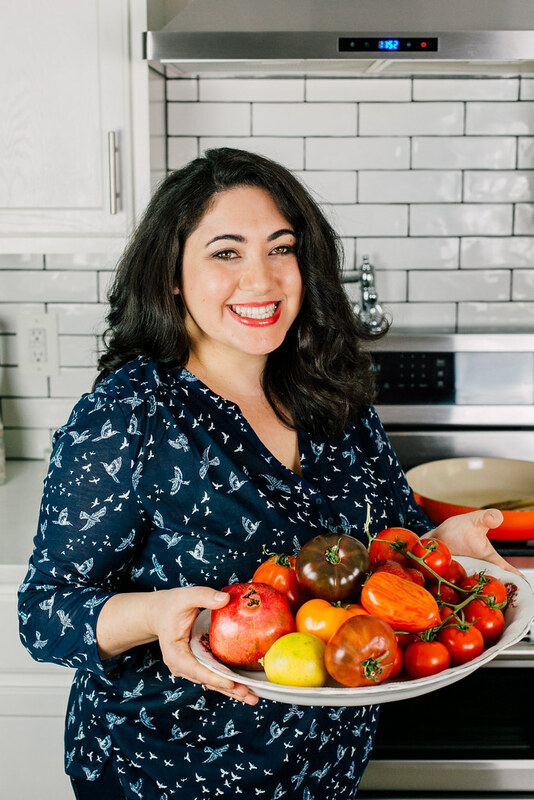 Love that you served it with grilled tomatoes and eggplant.